Here’s a new press release from Bruichladdich announcing the release of Organic 2003 “Culblair Farm” edition, with a UK Retail price of £39. It’s bottled at 46%, and there will be 15,000 bottles made available. It says “Anns An T-seann Doigh” on the label, which is Gaelic for “in the traditional way.” All of the barley used is Scottish grown, with 50% produced at 15 farms on Islay. I’m not completely sure what to make of this one, but it will be interesting to see the reviews. Would the fact that it’s organic and uses Scottish-grown (and lots of Islay-grown) barley influence your buying decision? The first ever organic Islay single malt whisky has been released to coincide with the opening of a new island barley facility for farmers and Bruichladdich distillery. Bruichladdich has released the world’s first organic Islay single malt whisky on the day the Hebridean island’s first grain facility opened – in time for this year’s barley harvest. This is the ultimate “single”, single malt (single farm, harvest, variety and vintage) distilled from Chalice barley grown by William Rose at Culblair in summer of 2003. This first organic bottling represents the direction Bruichladdich has been going since it was reopened in 2001. Unparalleled Scottish provenance, quality, variety and traceability. All Bruichladdich whisky is naturally bottled at the distillery in the island’s only bottling hall at 46% alc/vol with Islay spring water – chill-filtration and colouring-free. The Octofad facility (weighbridge, unloading area, drying house and storage) means each of the 15 Islay farm’s harvests can be kept separate until ready for malting later in the year. If you happen upon this page and have tried either of the first two Infinity releases, I’d love to hear your thoughts in the comments. 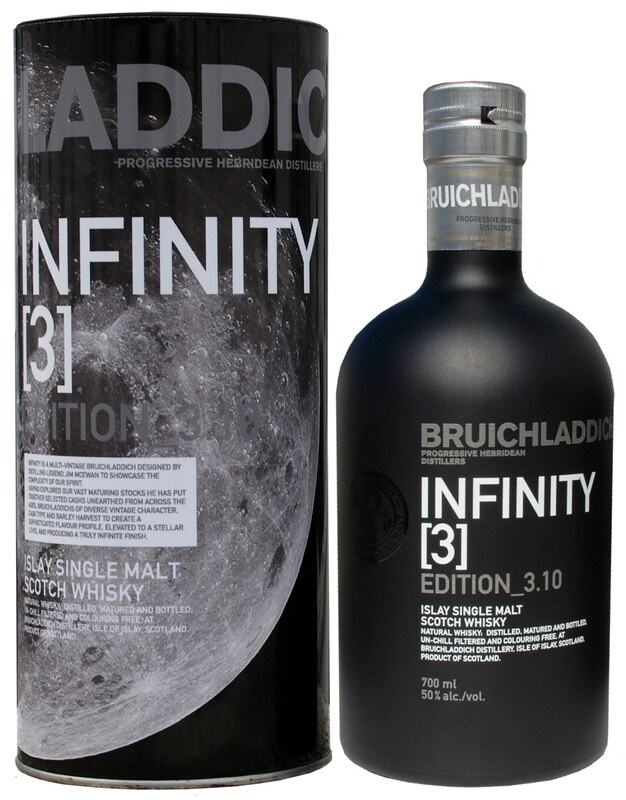 Infinity was created to showcase the great length of palate associated with Bruichladdich. This bottling, the third in the series, makes the ideal digestif. Jim McEwan, Bruichladdich’s head distiller, started his whisky career 45 years ago as a cooper rising to be master of that trade; he knows all there is to know about casks. That knowledge, together with his renown distilling experience, has led to the creation of Infinity 3, from casks specifically chosen out of over 35,000 maturing in our warehouses. Quercus Alba, better known as American oak, is the standard for Bourbon production then whisky aging. But unusually, in this case, the association is not US but entirely with Spain. 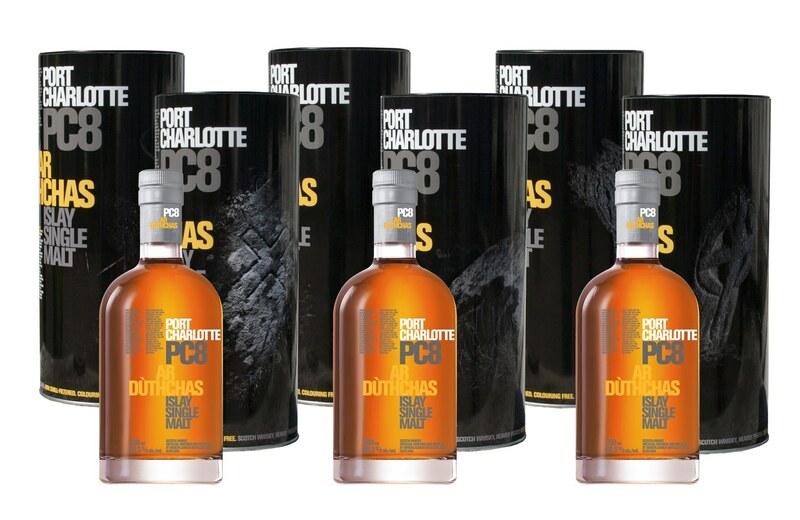 Only Spanish grown Quercus Alba – refill Sherry and Ribero (tempranillo) casks – were used for this multi-vintage Bruichladdich, drawn from several ages, styles and peat levels. The peatiness has been upped slightly over the two original bottlings, stocks of which are now exhausted. This is a general release, stocks are expected to last until 2011/12. The brief for this decidedly personal cuvée was to produce a complex, multi-layered malt with a provocatively infinite finish: the ideal digestif dram – mellow, rich, spice and fruit. Port Charlotte PC8 – This might be the one! PC8 wins the ‘Spirit of Whisky Fringe’ award. The annual Whisky Fringe tasting, organised by Royal Mile Whiskies, took place last weekend at the old church of Mansfield Traquair during the Edinburgh Festival. Around 200 whiskies were available for tasting by members of the public and all visitors were given the chance to vote for their favourite spirit tasted over the weekend. 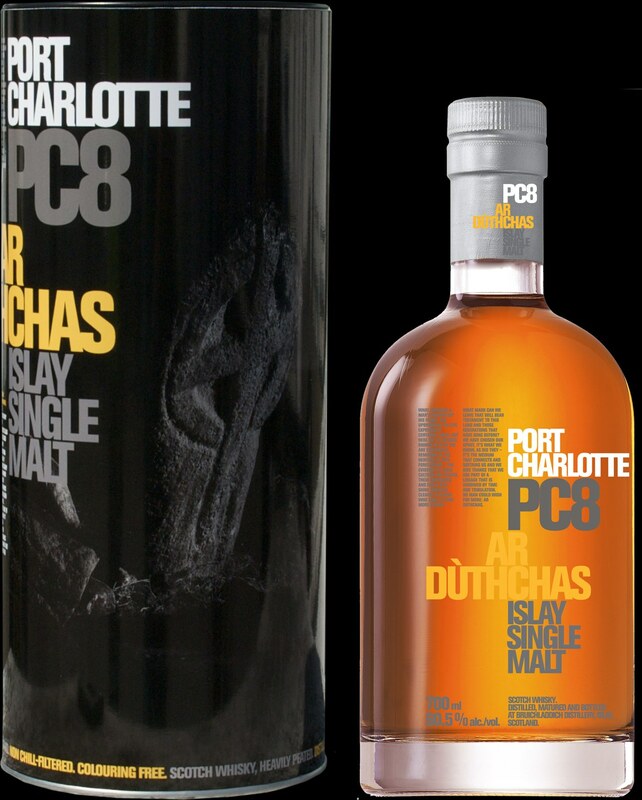 PC8, heavily peated Bruichladdich to the tune of 40 ppm’s worth, was voted by the general public as the Spirit of Whisky Fringe 2009, and awarded the trophy. Bruichladdich has been well received by Edinburgh’s whisky fans. In the last three years it has won this trophy twice and came second once. This achievement was all the more impressive as this 8 year old whisky was up against contenders that were considerably older, in some cases four times the age. PC8 is the fourth and final release in the dramatic 6 tin image series. The picture tins, having featured the distiller, his team, Islay people, now showcase Islay’s heritage. “Ar Duthchas”, land of our fathers, portrays landmarks from Islay’s remote Rhinns peninsula, celebrating Mans’ long presence, the tangible heritage, of this special isle. PC8, bottled on islay at 60.5% should be compared to previous bottlings PC5, PC6 and PC7 that were rated at 95, 96 and 96.5 in the 2009 Whisky Bible by Jim Murray.